So this is what my house looks like this week! This week we are hosting a Child Evangelism Fellowship 5 Day Club at our house! CEF is this awesome ministry that comes out and does a summer Bible camp, kind of like a vacation Bible School, but at day-cares, homes, and churches, and the like. They send 5 high school and college aged kids to come out and share about who Jesus was, the gospel, and do games and prizes and missionary stories and things like that. I went to the Dollar Store and bought a bunch of balloons to put up and put the posters on stop signs around our neighborhood to get the kids excited. Our neighborhood secretary even mailed out an email to whoever gets our neighborhood minutes about it and when another neighbor heard, they sent over chips, ring pops, lemonade mix, nutty bars, and oatmeal cream puffs and popscicles and watermelon for all the kids to have snack afterwards! The CEF missionaries came and the kids LOVED it! They were so funny and they had a blast listening to them tell them about Jesus and they sang songs and they really had an awesome time! I really enjoyed it and the kids had so much fun, I finally had to kick them out, because they seriously could not get enough and they just wanted to hang out! The kids that came are most of the kids that live right around me that we usually play with on a daily basis anyways. I was kind of hoping some other random people would come from reading our signs, but even if all that come are the 4 that came today, I know it was so special to them. 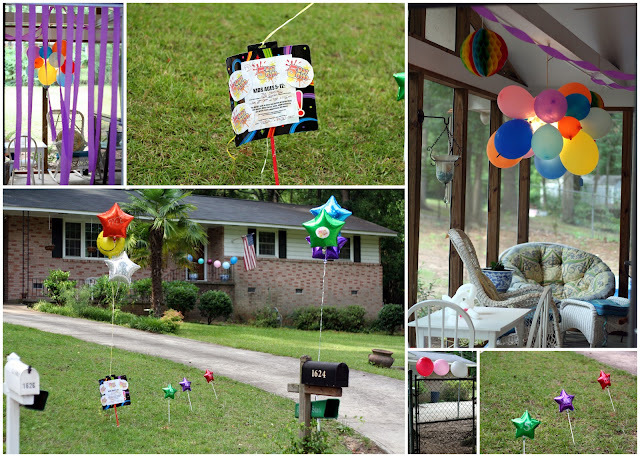 They couldn't believe how much I decorated for them and I really wanted them to feel special and know that this was special thing that I was doing for them so that they could learn about who God is! Afterwards, two of the 4 kids talked to two of the leaders to learn more about Jesus and they prayed with them. They had a great time and the cool thing is... they will be here all week doing this! Pray more of our neighbor kids will want to come and that the word would get out and that God would bring more and more to himself!